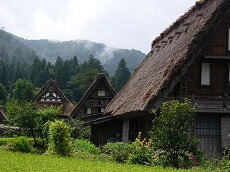 Takayama is a city in the mountainous Hida region of Gifu Prefecture. To differentiate it from other places named Takayama, the city is also commonly referred to as Hida-Takayama. Situated more than 650 m above sea level and surrounded by the brooding peaks of the Japan Alps, Hida-Takayama is a castle town at the foot of Takayama Castle, built in the 16th century. It is a town of old wooden houses standing side-by-side, highlighted by projecting lattice and eaves of uniform height, draws visitors' attention. This generally quiet rural town is known throughout Japan for its vibrant festivals that shatter the peace twice a year. 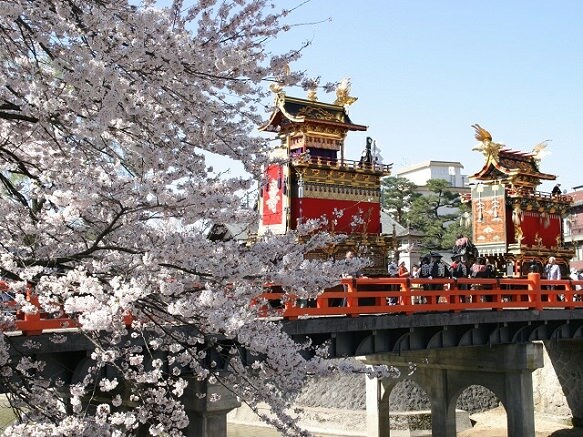 The Takayama-matsuri Festival, believed to have begun in the 16th to 17th century, is one of the three largest and most beautiful festivals in Japan and held in spring and fall. During the festival, intricate floats roam the city. 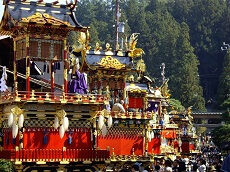 The floats, utilizing the essence of Hida's traditional techniques, are dazzling and magnificent. 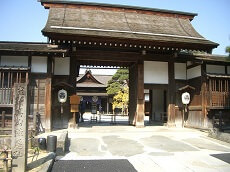 In spring, Hie-jinja Shrine plays a main role, while in the fall Sakura-yama Hachiman-gu Shrine plays a main role. Tens of thousands of Japanese descend on the town in spring and again in autumn to join the celebrations. Even if you are not in town during the festival you can catch a sight of the yatai (floats) in the Yatai Museum. 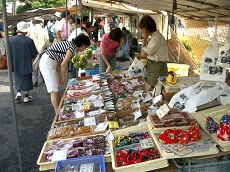 Takayama retains a traditional touch like few other Japanese cities, especially in its beautifully preserved old town. It now ranks as one of the prime candidates among travelers wishing to add a rural element into their itineraries.